VIENNESE PERIOD (1790-1802) – Classical works, Symphonies # 1 and 2, Piano Concerti # 1-3. HEROIC PERIOD (1803-1815) – Romantic works, Symphonies # 3-8, Piano Concerti # 4 & 5, Violin Concerto. LATE PERIOD (1815-1827) – Symphony #9, Grosse Fugue, Diabelli Variations, Missa Solemnis, last three Piano Sonatas. Collaborated with Goethe to create a literary period now called Weimar Classicism. An die Freude (Ode to Joy) first published in 1785. A second, shorter version published in 1803. Beethoven used the 1803 version that had 16 stanzas and 96 lines. Of those, Beethoven selected and re-ordered 36 lines. From 1815 onwards Beethoven entered a period of compositional draught. Between 1815-20, Beethoven got involved in a prolonged custody battle for his nephew Karl, with his brother’s widowed wife, that sapped his energy and creativity. In 1820 Beethoven re-invented himself and began a new period of composition. As early as 1793 Beethoven expressed desire to set An die Freude to music. In 1817 themes of the 1st, 2nd and 4th movements began to appear in Beethoven’s sketchbooks. Beethoven set to work on the score in1822 and completed it in February 1824. At first he wasn’t sure whether the final movement should be instrumental or vocal. First performance, May 7 1824 in Vienna. Beethoven, by then deaf, stood on stage, turned pages of the score and beat time, but the real conductor was Michael Umlauf. While the premiere was well received, the concert was financially unsuccessful. A second performance was poorly attended. The Ninth is a victory symphony, moving from D minor to D major. “The triumvirate of keys” (Greenberg): The predominant key areas of the Ninth are D minor, the key despair, B flat major, the key heroic struggle and D major, the key of triumph. The significance of D minor: “Associated with despair and especially with turbulence, D minor had been a powerful key for Mozart.” (Lockwood) This may have influenced Beethoven to use it rarely in his compositions until the Ninth. FIRST MOVEMENT: Allegro ma non troppo, un poco maestoso. Sonata Form. SECOND MOVEMENT: Molto vivace – Presto – Tempo I. Scherzo. THIRD MOVEMENT: Adagio molto e cantabile – Andante moderato. Slow movement. FOURTH MOVEMENT: Finale: Ode to Joy. Cantata. Starts quietly. Two falling notes, A and E are repeated in horns and strings, with a pianissimo pulsating accompaniment. These notes, separated by an interval of five, form an open fifth. The open fifths become more frequent. More instruments enter. Falling D and A pairs (open fourths) also appear. Music rises in a crescendo, leading to Theme I. The aura of the music is one of awakening or creation. This introduction will demarcate the various sections of the movement. The short-long rhythmic signature of the note pairs will be a prevalent in the rest of the movement and appear in other movements. The introduction is tonally ambiguous. No firm key area is stated, the two notes implying chords in different keys. This introduction has, among others, inspired those in Mahler’s First Symphony and Richard Strauss Also Sprach Zarathustra. A powerful, dramatic theme emerges in D minor, fortissimo and in unison in whole orchestra. The theme is has irregular phrasing. First phrase, clearly in D minor, is loud and heroic, with accompanying tympani rolls. A rising antecedent derived from the open fifths of the introduction is answered by a martial consequent. Next phrase is an interlude with three loud, rising orchestral chords sequenced once, followed by a brief fall. Third phrase is a brass fanfare with a distinct rhythm alternating with a quiet, three note, chorale-like music in horns. NOTE: This brass fanfare rhythm will be another recurring element in the movement. Music dramatically rises and suddenly dissolves in a rapid, down-spiraling passage. The pianissimo introduction returns with the same falling open fifths and fourths, and crescendo toward Theme I. A new version of Theme I presented, now in B-flat major. It is truncated and features the powerful first phrase antecedent and consequent, followed by a passage that derives from the consequent and develops it. A brief modulating bridge leads to the Theme II complex. NOTE: This early re-statement of Theme I in a distant key deviates from Classical Era procedure. Beethoven is introducing B flat as an important key area early on. Instead of a single melody, the complex consists of a series of themes. The key is B-flat major. The Classical Era procedure would have called for F major. The first, marked dolce by Beethoven, is smooth and lyrical. It anticipates Ode to Joy in the Fourth Movement. A passage of rising and falling scales derived from the modulating bridge music; repeated twice. Forceful fanfares derived from the last phrase of Theme I alternate with quiet winds. Slow interlude leading to the Closing Section, first with winds then descending strings. A new theme derived from the brass fanfare of Theme I, begins quietly, repeated in different instrument groups. It gains in tempo and volume leading to an energetic passage of rising and falling scales. A new passage repeatedly pits a quiet wind chorale based on Theme II against loud, hammering orchestral chords derived from the brass fanfare of Theme I. Loud martial music repeating the brass fanfare rhythm of Theme I concludes the section. NOTE: Exposition concludes on a heroic note, in the key of B flat major. NOTE: This section repeats, more-or-less the same, at the end of the Recapitulation. NOTE: The section features developmental music, a mini-development within the Exposition. Contrary to Classical Era custom and his own practice in prior symphonies, Beethoven does not call for a repeat of the Exposition. The exposition is long and complex; a repeat would have been cumbersome. The development is mostly concerned with Theme I. “(Beethoven) presents the development in two large chapters.” (Steinberg). In the second chapter the theme is treated to a massive fugue. A sudden orchestral burst of the martial closing theme of the exposition. A quiet, slow passage, a wind chorale derived from the third phrase of Theme I.
Wistful version of the powerful Theme I first phrase reveals a different facet of this tune and leads to another climax on the martial closing theme. Wind chorale returns and slows down. The music is anticipatory. A massive triple fugue, dramatic and turbulent, based on Theme I motives, propels forward with rhythmic momentum and does not let up, getting louder and more agitated. Music calms in another wind chorale. Theme I motive developed in a “famous and exquisitely plaintive passage” (Tovey), marked cantabile by Beethoven, reveals yet another facet of the theme, now lyrical. Music based on Theme II second phrase, still placid, dance like, in F major. Crescendo amid a big orchestral descent, with the harmony changing to imply D minor. The mood grows ominous as the music prepares for Recapitulation. NOTE: The development features dramatic juxtapositions. NOTE: The fugue is the dramatic center of the development. The introduction material returns in a most dramatic fashion, fortissimo, and with “ferocious, teeth rattling” (Greenberg) tympani rolls, in D major. Theme I erupts with the brass blaring out the antecedent and consequent of the first phrase in D minor. Music continues, loud and tragic, with a developmental extension of this material. Theme II complex is repeated in variation and in different key areas, all unexpected. In sharp contrast to the highly emotional, climactic recap of the Introduction and Theme I, the music is calm and mostly bright in its mood. Closing Section returns as in the Exposition, ending in D minor. Classical Era Recapitulations are mostly verbatim repetitions of the Exposition, entirely in the home key of the movement. This one is not. The dramatic entry into Recap with the introductory material loud and in D major anticipates the triumphant finale of the symphony. So does the first phrase of Theme II, the dolce precursor of the Ode to Joy, also in D major. Tovey interprets the D major dolce passage as “a powerful expression of tragic irony,” for it makes but a fleeting appearance, to be swallowed up in D minor pathos at the end of the movement. The Coda is essentially a second development section. Quiet woodwind interlude with distant horns. Strings enter in bass counterpoint, with the subject of the great fugue from development. The bass takes over “in a menacing crescendo” (Tovey) followed by rising-falling scales of Theme II repeated twice. A quiet, almost pastoral passage in horn and winds, in the key of D major, appears to calm the agitated mood of the prior music. It doesn’t last long. The harmony shifts back to D minor, with the music rising in a series of three exclamations. Quiet anticipatory music in winds. It sighs at it slows. Something important is about to take place. A funeral march appears in D minor. The main melody is derived from Theme I. A descending chromatic bass line imparts the music with its funereal character, along with its slow tempo. The funeral march rises in a slow crescendo. As more instruments join in, the chromatic bass rises to the surface, “dominating the entire orchestral texture” (Kindermann) and leads to a series of fortissimo chords. The overall effect of this music is one of deep pathos. NOTE: This loud music derived from the chromatic bass of the march is a brand new theme, never heard before. Final, definitive, fortissimo re-statement of Theme I in D minor. It is the first phrase, the antecedent, two loud, rising D minor scales and the consequent. After all the dramatic juxtapositions and key changes of the long movement, the end of the Coda confirms D minor as the main key of the movement, the music in a state of despair and pathos. In the two quiet sections of the Coda the pastoral D major episode is later pitted against the remarkable funeral march in D minor. These exemplify the central conflict of the Symphony’s overall narrative. Downward arpeggiated D minor triads, syncopated and with dotted rhythm, repeated four times, the third as a tympani roll. NOTE: This rhythm will pervade the scherzo sections of the movement. A four-part fugato in D minor, derived from the introductory motive, maintaining its characteristic rhythm. It begins quietly in high strings, with lower strings joining in imitative fashion. FIRST THEME: More and more instruments join in as the music rises and the polyphony coalesces into a dramatic, loud, homophonic theme with a strong rhythmic drive. SECOND THEME: Brief transition in winds is followed by an energetic dance tune in F major. CODETTA: Motives derived from first and second themes briefly re-stated; transitional anticipatory music with pauses. A more elaborate, extended variation, somewhat developmental in nature. Fugato begins in three parts in winds, marked Ritmo di tre batute (rhythm of three beats). Truncated from four to three beats, the music assumes a new rhythmic drive. Tympani interrupts with four consecutive rolls, each four beats, as if trying to correct the rhythm. NOTE: This new fugato, with its altered and varying rhythms is exemplary of Beethoven’s propensity for rhythmic manipulation. It appeals to modern ears, accustomed to the same in contemporary popular music. Fugato continues in three beats, in other instruments groups, in a developmental passage. Homophonic First Theme appears in variation, now louder, more heroic, and extended. Second Theme in variation, also extended. Includes tympani beats. In a transitional passage, derived from the fugato subject, marked stringendo il tempo (speed up), Beethoven smoothly changes the meter from 3/4 to 2/2 in a procedure nowadays labelled metric modulation. FIRST THEME: A shepherd’s tune in oboes and clarinets, accompanied by staccato bassoons, in D Major. NOTE: This First Trio Theme closely resembles the Ode to Joy. As in the first movement Theme II, Beethoven foreshadows the Fourth Movement. SECOND THEME: A lush, lyrical string melody, presented in two phrases, in D major. FIRST THEME VARIATION: Begins in horns accompanied by staccato strings; sounds like hunting horns, a forest scene. Melody extended in oboe, in another shepherd’s episode. Leads to a spirited, loud version in violins. Second Theme and First Theme Variation repeated. TRANSITION: Music based on the First theme, slows down, softens and modulates to D minor. Pause. First Statement of Scherzo repeated verbatim. Second Statement of Scherzo repeated verbatim. Music derived from First Scherzo Theme, in crescendo and accelerando, and in D major leads to a brief re-statement of the main Trio theme, also in D major. The trio theme is abruptly cut off. Brief pause. A series of loud, falling octaves in D major end the movement. 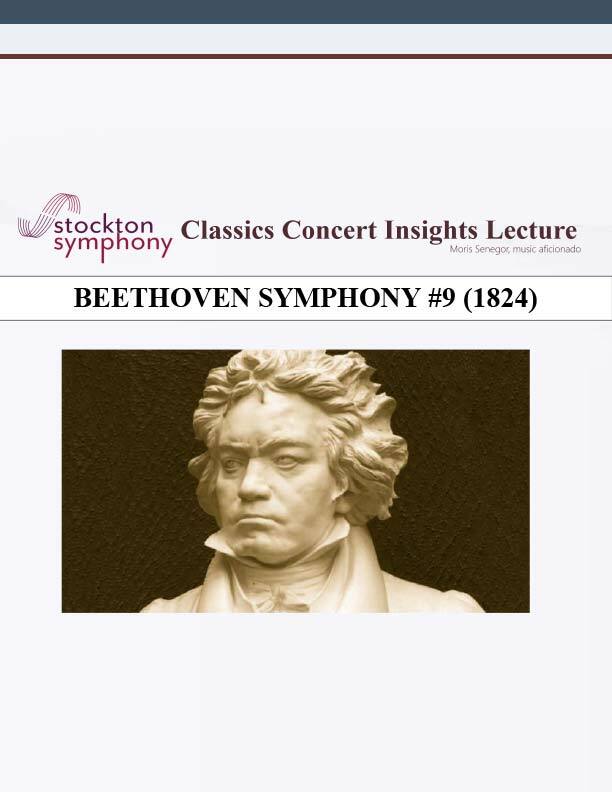 In a surprise move, Beethoven ends the movement in D major, and thus advances the narrative of the symphony from the funeral march, D minor ending of the First Movement. At the end of the Second Movement, there is hope. This is the slow movement. Two themes presented and repeated in alternate variation. Toward the end the procedure breaks down and the music becomes somewhat developmental. The ending, with disrupting fanfares, contrasts with the earlier serenity. Introduction: Two note, step-wise descending motives in strings echoed by winds. Theme A: Serene, lyrical song in strings, in B flat major, duple meter (4/4). Each phrase echoed by the winds. NOTE: The leisurely tempo, calm dynamics, and a stable harmony, firmly based on B flat, impart a sense of serenity to this music. Transitional music modulates from B flat to D major. Theme B: Gorgeous four-square melody in strings in D major, triple meter (3/4), derived from the introduction motives. NOTE: Theme B is reminiscent of the Ode to Joy theme of the fourth movement. Transitional music modulates back to B flat. Theme A, Variation I: Extended, more ornamented, dance-like version with pizzicato string accompaniment. The woodwind echoes of each phrase remain unvaried. Transitional music modulates to G major. Transitional music modulates to E flat major. Interlude: A woodwind chorale in E flat major, based on Theme A material. NOTE: This chorale features a famous moment in the Ninth Symphony, a rising melody played by a solo horn. The part is assigned to the fourth horn instead of the first, as it should have been. The story is that during the premiere, the fourth horn player showed up with a newfangled horn that had two valves. In those days horns were valveless. Beethoven assigned the solo part to this player and since then tradition has demanded that the part go to the fourth horn. Another series of fanfares (E flat major). followed by a quiet, string chorale with fanfare figures in accompaniment, “in the somber key of D flat.” (Tovey) Music sounds pleading and uneasy. Coda begins with a new sounding theme (B flat major), derived from Theme A, marked cantabile by Beethoven. Ends with a louder extension. Two note stepwise descending motive of the introduction returns in winds, in a quiet passage with a throbbing string accompaniment (B flat major). Final gestures: Music rises and climaxes in two loud orchestral chords. Serene string chorale. One more loud orchestral chord. Quiet concluding chords (B flat major). “Slow variation movements employing two themes are characteristic of Haydn but uncommon in Beethoven.” (Kindermann) The only prominent example is the slow movement of Beethoven’s Fifth. Beethoven’s “peculiar use of the word cantabile:” “Beethoven applies the term …to passages of a simplicity which makes them liable to be overlooked.” (Tovey) Examples are: First Movement Theme II, first melody, and beginning of Third Movement coda. The “disruptive fanfares” toward the end of the movement “contribute to a strangely disquieting atmosphere in the coda.” (Kindermann) This sets the stage for the Schreckensfanfare (horror fanfare) that starts the Fourth Movement. “This Adagio and its lyrical extensions bring an oasis of peace and contemplation.” (Lockwood) It signifies arrival at a desirable condition in mortal life.The Fourth Movement will now propose a Utopian ideal beyond. CANTATA: Sacred or secular musical work, generally for chorus and orchestra. The Fourth Movement is a free standing Cantata with an instrumental Overture and four choral Acts. It is tied to the rest of the symphony with its Overture. NOTE: The sections of the movement are clearly demarcated with pauses between each. This section features a retrospective review of prior movements along with an instrumental recitative by a hero speaker. The music of the prior movements is rejected and a new music, the Ode To Joy is previewed. Introduction, Schreckensfanfare (horror fanfare): Begins with a remarkable dissonance, a chord that combines B flat major and D minor. “The most horrendous noise Beethoven could devise.” (Steinberg) The term Schreckensfanfare was coined by Wagner. Sudden, loud, turbulent fanfare in D minor, in winds, brass and percussion, in triple meter (3/4). Low strings (cellos and basses) begin an instrumental recitative. This is the voice of a male hero, who will later appear as the solo baritone. Schreckensfanfare repeated in another dramatic, dissonant passage. Low strings respond with another recitative. Music modulates to B flat major and calms down. Second Movement recalled and rejected: The fugato theme of the Scherzo appears (A minor). The low strings respond in a brief and more subdued passage (F major) ending in another pause. Third Movement recalled and rejected: Theme A of the slow movement appears (B flat major) is a longer, more leisurely passage. Low strings respond, brief and “scornful” (Steinberg). Ode To Joy preview: Motive of the Ode To Joy melody briefly appears, repeated twice (D major). This is cut off by the low strings in a longer passage with loud orchestral chords in emphasis, enthusiastically accepting this new theme. Ends in a D major closed cadence, the first one in the symphony so far. The full Ode to Joy melody appears and is repeated verbatim, in three, increasingly dramatic variations. This entire section is in D major. Ode to Joy, First statement: Simple melody, unaccompanied, in cellos and basses. Note the a-b-a’-b-a’ phrase structure. Ode to Joy, Variation I: Same melody, now in cellos and violas, giving it a higher string sound, with bassoon providing a counter-melody in accompaniment. Ode to Joy, Variation II: In violins, the string sound yet in higher register. The texture thickens to a four part harmony. Volume rises in the last “b-a’” phrase pair in preparation for the next variation. Ode to Joy, Variation III: Loud and glorious, joyful and, celebratory, in the entire orchestra, trumpets blazing the tune, accented with prominent tympani beats. Codetta: Momentum continues, with full orchestra extending the melody on a motive derived from the theme to an open cadence and pause. The Fourth Movement is the first of its kind in the history of symphony, incorporating human voice to the music. Beethoven achieves a rousing effect in his statements of the Ode to Joy by keeping the melody unchanged and expanding its texture and dynamics. The increasing complexity of texture, with the progressive assembly of additional instruments, is a metaphor for a growing population of people joining in the triumph of the message. Orchestral tutti based on this music picks up energy and momentum. After the glory of the Ode to Joy, the expectation is more of the same. Surprise! Schreckensfanfare reappears, in D minor, loud and dissonant. Open cadence and pause. Solo baritone pleads in an acappela recitative, “O Freunde, nicht diese Töne!” Oh friends, not this tone! Quiet string interlude. Baritone continues. “Sondern lasst uns angenehmere.” Rather let us sing more pleasantly. Loud orchestral chords in emphasis. Baritone sings last line. “Anstimen un freudenvollere.” And more joyfully. Single loud orchestral chord. Pause. NOTE: These are Beethoven’s own words, not Schiller’s. Two shouts of “Freude!” (Joy!) by baritone, each echoed by choral basses. Winds accompany, quietly foreshadowing the Ode to Joy. was die Mode, streng geteilt what custom has torn apart. wo dein sanfer Flügel weilt where thy gentle wind is spread. The four vocal soloists (soprano, alto, baritone and tenor) sing the second verse of the Schiller poem with the a-b-a phrases of the Ode to Joy, in polyphony. mische seinen Jubel ein! let him join the rejoicing! Sein nennt auf dem Erdentund! Join in our song of praise! Weinend sich aus diesem Band! Weeping from our band! Chorus repeats the last two verses from “Ja, wer auch,” onwards with the second b-a’ phrases of the Ode to Joy. An den Brüsten der Natur. at nature’s breast. Folgen ihrer Rosenspur taste of her rosey gift. Und der Cherub steht vor Gott! and the Cherub stands before God! Chorus repeats the last two verses, from “Küsse gab sie uns,” onwards, with the second b-a’ phrases of the Ode to Joy. This is the loudest, most dramatic Choral section yet. NOTE: These three choral versions of the Ode to Joy parallel the earlier instrumental variations, going from simple to more complex in texture and dramatic expression. Beethoven delays the vocal version of the last, glorious variation until the end of Act II. This section is the Triumph of the Ode to Joy. Beethoven marks the score alla Marcia (with march rhythm). It is in four subsections. Out of the silence a distant bassoon begins a march with a bass drum beating the rhythm. The Ode to Joy appears as a march in winds with cymbals and triangles (B flat major). The melody gradually gets louder, giving the impression of a distant army marching closer. This is the only time Beethoven used the bass drum in any of his symphonies. Note the significance of B flat major as the symbol of heroic struggle, now in a heroic march. The Turkish March variation is the same melody as the original Ode to Joy, but with each note doubled. The doubled pairs have the same short-long rhythmic signature as the Intro of the First Movement at the very beginning of the symphony. Solo tenor sings the a-b-a phrases of the next stanza, in broken phrases, using the melody of the march variation. laufet, Brüder, eure Bahn, Brothers, run your course. freudig wie ein Held zum Seigen. Joyful as hero to victory. Male chorus repeats the last b-a’ phrases from “laufet, Brüder, eure Bahn,” onwards. A massive four part fugue (B flat major) with its subject based on the march variation of the Ode to Joy. Begins in violins, progresses in imitative entry toward the lower strings. The fugue is energetic and with forward driving momentum. Transitional, anticipatory music: quiet passage of horn fanfares alternating with Ode to Joy motive in winds. NOTE: This instrumental fugue will have a choral counterpart toward the end of Act III. Massive, glorious, fortissimo reprise of the first verse by the entire chorus. Orchestral extension begins as in the earlier version but is soon, abruptly cut off. NOTE: This is the choral counterpart to the final, glorious instrumental variation of the Ode to Joy. This is a section of Thanksgiving and Heavenly Devotion. It features music that sounds ecclesiastic. Seid umschlungen, Millionen! Be embraced, ye millions! Diessen kuss der ganzen Welt! This kiss is for all the world. Loud trombone accompaniment, in unison with the chorus, gives the music a ceremonial air. This is the first entry of the trombone since the scherzo. NOTE: The simplicity of this new melody and its lack of texture give it a plainchant-like quality. Full chorus and orchestra repeat the verse but now in a thickly textured version, with the harmonies filled in. Same procedure repeated for the next verse, still plainchant-like. Male tenors and basses proclaim this with trombone fanfares in accompaniment. Chorus and orchestra repeat the verse in a polyphonic version, fortissimo (F major). Quiet instrumental passage with a church-organ like sound (G minor). Chorus sings two verses in a slow, devotional hymn. Ihr stürtz nieder, Millionen? Do you fall in worship, ye millions? Ahnest du den Schöpher, Welt? Do you know your creator, world? Such’ihn über’m Sternen zelt Seek him above the starry heavens! Über sternen muss er wohnen Above the stars he surely dwells. The music rises on the word Welt (world) and again on zelt (heavens). The last line Über sternen muss er wohnen, proclaimed fortissimo. Pause. Very quiet, shimmering, heavenly music. Pause. “The chorus breaks into a torrential double fugue of the two main themes,” (Tovey), the Ode to Joy and Hymn of Brotherhood. The music is back to D major, the key of triumph. The fugue is slow and sustained. Music abruptly drops to pianissimo, “an abrupt plunge into the deepest prostration.” (Tovey) Chorus quietly sings the following two verses with a pulsing accompaniment. Ahnest du den Schöpfer, Welt? Do you know your creator, world? Such’ihn über’m Strenenzelt, Seek him above the starry heavens. Music rises on the last line. ein lieber Vater wohnen a loving Father must dwell. The accompaniment is shimmering, heavenly music. Rising melody on strings, D major. Solo quartet sings the first verse of the poem with a new, fast, cheerful variation of the Ode to Joy in imitative polyphony. The passage rises from piano to forte. Tochter aus Elysium! Daughter of Elyseum! was die Mode streng geteilt. what custom has torn apart. Full chorus sing the second verse, “Diene Zauber,” onwards. Music rises to a climax. Music slows and drops back to piano on the next verse, sung by full chorus. Wo dein sanfer Flügel weilt. where thy gentle wing is spread. Wind and horn interlude; tempo faster. Full chorus sings the “Deine zober,” (Thy magic) verse, in a fast crescendo. Chorus recites the phrase “Alle Menschen,” from the “All men shall be brothers” verse, fast, fortissimo, in polyphony. The rest of the verse “All men shall be brothers, where thy gentle wing is spread,” in a more quiet, hymn like passage, the texture simplified. Multiple melismas on “Wo dein sanfer Flügel weilt,” (Thy gentle wing is spread), sung slowly, give the music a plainchant-like quality and tone paint flapping wings. Pause, before the grand finale. Quiet, descending two step motives pick up speed. Fast crescendo into a celebratory instrumental introduction of the full chorus, with multiple percussion instruments. Seid umschlugen, Millionen! Be embraced, ye millions! Diesen Kuss der ganzen Welt! This kiss is for all the world! muss ein lieben Vater wohnen. a loving father must surely dwell. Freude, schöner Götterfunken! Oh Joy, thou lovely spark of God! The momentum breaks with “Tochter aus Elysium,” (Daughter of Elysium), sung in unison, slower and quieter, emphasizing the line. “Freude, schöner Götterfunken, Götterfunken,” (Oh Joy, thou lovely spark of God), sung loud, in unison, with a slower tempo and with cymbal clashes at the end of each word. Marked Prestissimo by Beethoven, the movement concludes triumphantly in orchestra with a fast version of the Ode to Joy, based on the variation that began Act IV. The Coda does not present any new verses of the poem. It revisits those that Beethoven considers worthy of emphasis. The beginning of the Coda is remarkable for its child-like joyful simplicity, refreshing after all the variations of the Ode offered so far.